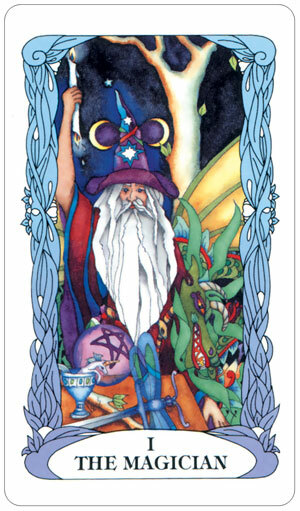 Tarot of a Moon Garden generally displays traditional Rider-Waite symbolism but in a much more fantastical way! 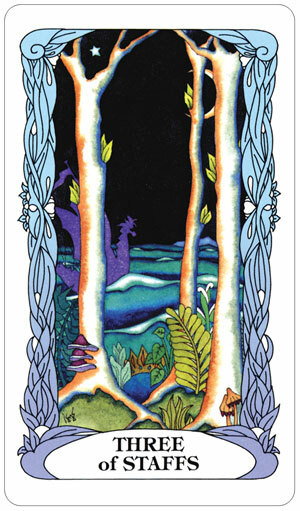 Each card is full of fairy tale imagery framed by twisted, ancient vines. Illustrated by fantasy artist Karen Marie Sweikhardt, the drawings have a captivating childlike charm, but are beautifully rendered in (what looks like) watercolors. 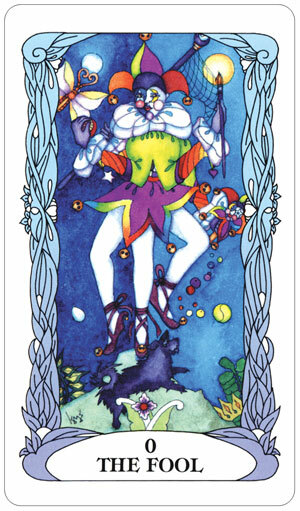 An entirely enchanting deck for lover of all things High Fantasy and Fairy Tale! 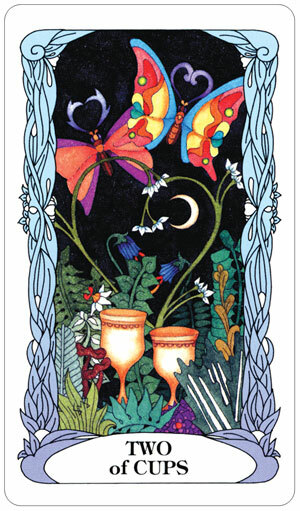 "Tarot of a Moon Garden delivers its arcane secrets on the wings of dragonflies, butterflies, angels, and fairies. 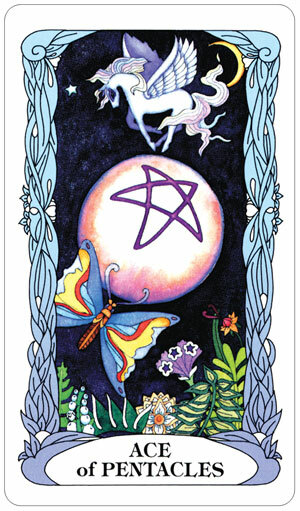 Unicorns and dolphins bring insightful messages from faraway lands. 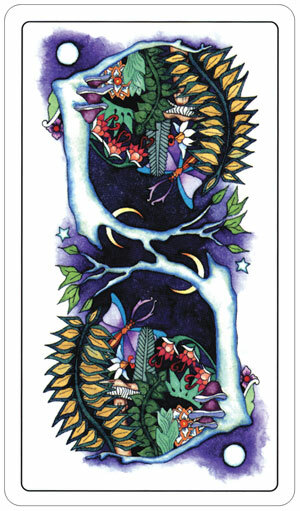 This luminous deck weaves together traditional tarot symbolism, elemental magic, and the reflective phases of the moon. 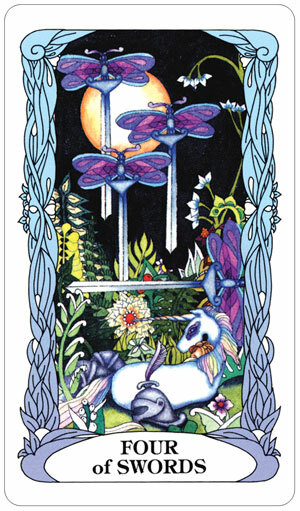 Tarot of the Moon Garden follows the traditional four suits of tarot with dragonflies forming the hilt of the suit of swords. Dragons indicate areas for transformation and warn of temptation. 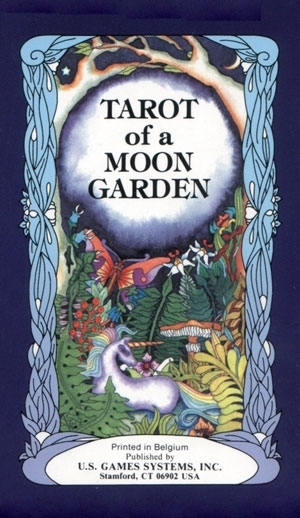 Let the lunar energy of the Moon Garden inspire you as you explore the places your imagination with lead you. Booklet by Laura E. Clarkson includes upright and reversed meanings. Paintings by fantasy artist Karen Marie Sweikhardt." For a deck this size, we recommend our Regular size, Double Draw, or Silk bags.